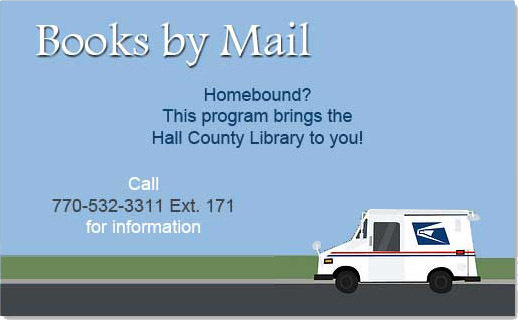 Books by Mail provides books, DVDs, audiobooks on CD, video games and music CDs to homebound people of all ages. The service is free to residents of Hall County, GA who are unable to leave home because of a temporary or permanent disability. All you need is a Hall County Library Card in good standing. Anyone with a physical disability who is unable to leave home, dependent on others for transportation, or unable to read conventionally printed material. Also, mothers with newborns, those temporarily convalescing after surgery or an accident, and Caregivers providing hospice or home health assistance. We loan materials for 4 weeks. Mailing time is included in the due date. Fines will not begin to accrue until three days after the due date. When your registration is processed, you will receive your first books by mail. You will also receive a welcome letter to further explain the service, including information about how to contact the library, how to change information on your application, and how to select, return and renew your library materials. If you have questions, please call Brian Hood at 770-532-3311 x171.